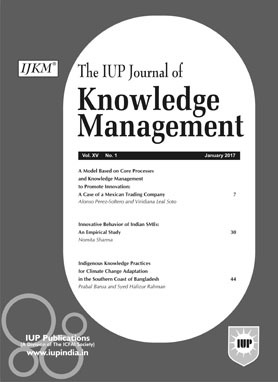 It is a quarterly journal that focuses on Product knowledge, Services knowledge, Process knowledge, Customer knowledge and Knowledge assets; Developing appropriate culture for knowledge management; Integrating learning and knowledge infrastructure; Linking knowledge management to performance; IT tools for developing knowledge management; Policy initiatives and Strategy for better knowledge management. In recent years, customer knowledge has become a crucial element to meet customer demands; it represents essential information for the development of the company's processes and provides competitive advantages that could create value for the client. This converts the customer into an active part of the company and reduces product setbacks or mistakes. This paper proposes a model that utilizes customer knowledge as well as the knowledge of the organization to recognize needs; it is based on a Customer Relationship Management (CRM) process. The model was implemented in a company dedicated to the machining of precision parts in northwestern Mexico; it identified which knowledge was necessary for each customer project and the preferred communication channel per customer; a CRM software was installed in the company which provided traceability of the work starting with the quotation. This paper demonstrates that the continuous use of a CRM strategy can improve communication, reduce rework and improve customer trust. Knowledge sharing has always been a challenge for organizations practicing knowledge management initiatives. Although comprehending Knowledge Sharing Behavior (KSB) requires psychological study, there are a few studies that have investigated the psychological aspects of KSB deeply. This quantitative research aims to predict knowledge sharing by studying the relationship between people's early core beliefs and their KSB. For evaluating people's core beliefs, a questionnaire was distributed among the employees of Oil Industries Commissioning and Operation (OICO) Company, Tehran, Iran. 214 employees from different levels of the organization participated in the survey. The response rate was 61.84%. Early core beliefs, including "I am OK and you are OK", "I am OK and you are not OK", "I am not OK and you are OK", and "I am not OK and you are not OK", are shaped in early age and influence people's adulthood behavior as a fundamental attitude. The results show that there is a positive relationship between core beliefs and KSB. The primary goal of this research is to search for relevance in social knowledge with respect to the role played by social information in economic modeling. Social information is derived from social processes. We attempt to explore how social concepts and principles find applications in science of economics and how they could be used more efficiently to model the behavior of economic agents. In attempting to do so, we try to elucidate what social knowledge is and what constitutes the body of social information per se. With the growing importance of digital knowledge and information in the society, our analysis sheds light on the role played by social elements in economic theory and modeling that furnishes important data and information about various social processes which can no longer be ignored, despite the preponderance of scientific and technical knowledge in the society. We review, from the point of view of Kenneth Arrow's perception of social knowledge, how knowledge of social processes could be employed more efficiently in economic modeling in dealing with practical economic problems that have much relevance to economic processes. This research takes an aim at that direction by elucidating the concept of social knowledge in its present context-the digital age-with the aim of advancing knowledge in this field. Finally, the study also provides general knowledge about the subject of social knowledge in the context of economic growth.